Are UK Universities letting our students down? Students demand better understanding about intellectual property (IP) and how it impacts them, as evidenced in a new IPAN research report: “University IP policy – perception and practice” launched on 27th July. – a typical student response to the online questionnaire about perception and practice of IP policy on campus. 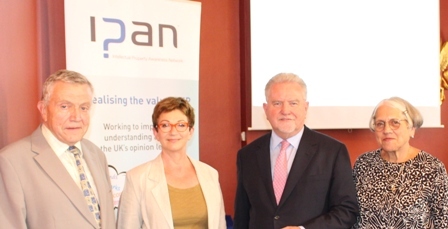 The research, commissioned by IPAN, was carried out by the National Union of Students Insight research group and surveyed the views about IP, its teaching and policy impact, of 2800 students and 250 teaching staff across 150 UK Universities and Higher Education Institutions (HEIs). It confirms anecdotal opinions that knowledge about IP continues to be poor across the HEI sector and is frequently limited to copyright and plagiarism. It concludes with recommendations to higher education policy makers and those concerned with future enterprise capacity of UK plc. Sir Rod Aldridge the entrepreneur and philanthropist introduced the launch of the report and is pictured (centre right) with Prof. Ruth Soetendorp, Mandy Haberman and Steve Smith of the IPAN Education Group which prepared the research report based on analysis and research findings generated by the independent NUS Insight group. Sir Rod emphasised his support for the report’s recommendations and his enthusiasm that all future entrepreneurs learn about IP. Anti-Copying in Design (ACID), Alliance for Intellectual Property, Chartered Institute of Patent Attorneys (CIPA), RCUK Centre for Copyright and New Business Models in the Creative Economy (CREATe), Federation against Software Theft (FAST), Institute of Trade Mark Attorneys (ITMA), McDaniel & Co and Sybaris Legal & IP.